Only two of the Trekker's twelve accessories lock into place, but they're the most important to contain this feature: a large screwdriver, and a serrated blade that can be easily opened with one hand. You'll find these other accessories on the Trekker as well: bottle opener, wire stripper, can opener, smaller screwdriver, Phillips screwdriver, saw blade, reamer/awl, key ring, toothpick, and tweezers. The handle measures 4.375 inches long and is contoured for an ergonomic grip. All the metal components inside that handle are made from stainless steel and protected by rust-free aluminum alloy separators. 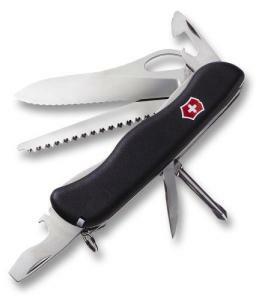 Looks like the Trekker is a good step up from the basic Swiss Army knives, and would be a great thing to have if you'd rather have a hiking tool on your key chain instead of in your backpack.